Editor’s Note: To jump to Part 2 of this story, available exclusively online, click here. 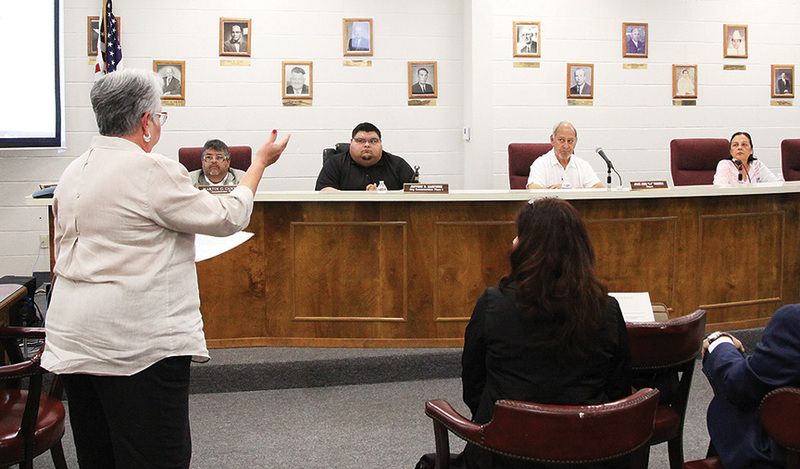 The City of Port Isabel continued an examination of its past financial practices this week as the City Commission heard the preliminary report of a forensic audit into its revolving loan program (RLP). The audit report was the second such report presented by Billy Bradford, Jr., a certified public accountant with Brownsville firm, Hales – Bradford, LLP. Last month, Bradford delivered a report about the Yacht Club restoration project, which he said resulted in a loss of approximately $760,000 for the City. In that report, Bradford focused on the activities and accounting of an architect and consultant who led the project, Theresa Fonseca and Petra Reyna, respectively. Reyna also served the administrator of the RLP, soliciting participants to the program, and receiving loan payments from borrowers, which she then remitted to the City. 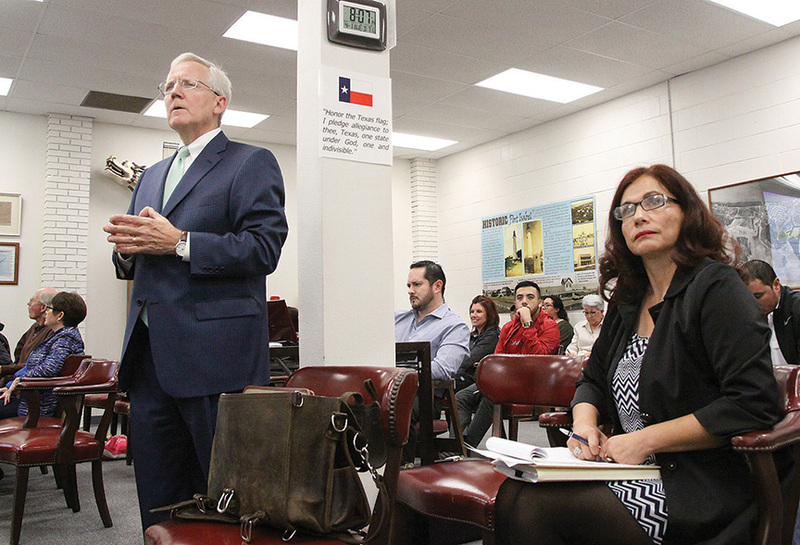 Disturbed by the allegations made in last month’s preliminary audit report, Reyna attended Tuesday evening’s meeting to counter the auditor’s claims. Editor’s Note: To read the rest of Part 1, pick up a copy of the Port Isabel – South Padre Press on stands now. For Part 2, available exclusively online, continue reading below. Glenna Mahl was just the second person to apply for funds from the revolving loan program. In June 2010, the Port Isabel City Commission approved Mahl’s $80,000 loan application to open an insurance adjusting business called Agency Adjusters. She used her Los Fresnos home and two lots on South Padre Island as collateral. But the loan application was not without cause for concern, Bradford explained. The house Mahl listed as collateral was already subject to some other, unnamed debt, which meant the revolving loan program would be in a second lien position if Mahl were to default. And default Mahl did. According to Bradford, Mahl defaulted on her loan after just “one or two” payments. His investigation indicated that the revolving loan funds never went to open a business, but had instead been used to “clean up the piece of collateral that was in Los Fresnos,” Bradford said. Bradford surmised the ill-fated loan had been approved, despite reservations noted at the time, in a last minute attempt to hang onto USDA grant funding. The revolving loan program was supposed to be administered by the EDC using two different kinds of funds from the USDA — the Rural Enterprise Business Grant (REBG) and the Intermediary Relending Program (IRP) — which Petra Reyna applied for on behalf of the EDC. Reyna submitted the applications to the USDA for both funding sources, subsequently charging the City of Port Isabel $4,000 per application, Bradford said. These fees were in addition to the payment agreements Reyna had with the City for managing the RLP and providing consulting services. “Those were two payments that concerned us greatly, quite frankly,” Bradford said. “We felt that, in our estimation, the criteria indicated in the responsibilities of servicing the program would have covered that,” he said, referring to a 19-point list of criteria that detailed what services Reyna would provide to the EDC in managing the revolving loan program. The USDA’s REBG funds came in the form of a $300,000 grant which required a 35 percent match in funds — some $105,000 — from the EDC for a total of $405,000. Bradford described the grant as a “line of credit” the EDC could draw from to lend to borrowers without physically possessing the cash itself. The USDA also required that the money be used within a certain timeframe, lest the unused funds be forfeited. The IRP, in contrast, was “a loan that the EDC would enter into and physically take possession of that money,” Bradford said. Through the IRP, the EDC borrowed $400,000 from the USDA to lend to local borrowers. It, too, required a match from the EDC — $112,500. Combined, the EDC had $917,500 available to lend to Port Isabel’s small business owners. The EDC used REBG funds for those two initial loan applications. The first, for $65,000, went to Anna Melina for her business, Anna’s Hair and Nail Salon, and was approved by the Commission on May 19, 2010. The Commission approved the second loan, for $80,000 to Glenna Mahl, a month later on June 16, 2010, according to information Bradford presented Tuesday. However, the City Commission didn’t approve another loan application until almost a year later, on March 29, 2011. But, by that time, the clock had run out on the remainder of the $300,000 REBG grant funds. The EDC had used the grant to distribute $145,000 in those two loans, one of which Bradford characterized as appearing “as if this were a rush to judgement — that if we didn’t loan this money out, that grant was going to be forfeited,” he said. From then on, however, the monies the EDC loaned to other borrowers came from its own match contributions, or from the USDA IRP loan, Bradford said. The EDC received 16 more loan applications, or “opportunities,” as Bradford referred to them. The Commission approved 14 of them, and chose not to go through with two, Bradford said. In all, the City lent $655,000 to RLP borrowers, but spent another $155,000 in administration fees to Petra Reyna, Bradford said. “At that point, the EDC had two contributions in a loan and grant that about half of it was forfeited,” Bradford said. “And of the two loans that were made, more than half of them went in default, like that,” he said, snapping his fingers for emphasis. The bulk of the borrowers remained in good standing, Bradford said, with the exception of two microloans. In an interview after Tuesday night’s meeting, City Manager Jared Hockema explained that the RLP includes a provision that allows microloans for up to $5,000. “The loans, to my knowledge, that were above that limit were collateralized,” Hockema said. Of the two microloans, both of which went towards a business called Red Line Fire Safety, one was unsecured and the other was collateralized with a “travel trailer.” The borrower filed for bankruptcy protection, Bradford explained. Petra Reyna was under several agreements to provide services for the City of Port Isabel during this time period — she managed the revolving loan program, was one of the principal consultants on the Yacht Club project, and also provided consulting on the City’s historic structures and places. The City of Port Isabel paid Reyna $2,500 per month for managing the RLP and another $2,500 per month for the Yacht Club project. By the end of her relationship with the City, those payments had increased to $3,000 per agreement, per month, according to a chart Bradford displayed Tuesday. By July 2016, the City had paid Reyna $331,500 for her services. Bradford estimated that approximately $155,000-160,000 of that money was for services rendered managing the RLP. But nailing down the specifics both of payments made to Reyna for her services, and payments received from RLP borrowers was made difficult due to a lack of recordkeeping, Bradford said. Though the EDC entered into an agreement with Reyna for the RLP in March 2009, Bradford’s firm could find no evidence of payments sent to her until February 2010. “This speaks to the breakdown in the recordkeeping, to some degree,” Bradford said. “Even though the original agreement was entered into in March 2009, we don’t have record of any payment being made. That doesn’t mean it wasn’t made, we just couldn’t find an indication of a consulting payment being made to Reyna Associates,” Bradford said. Compounding the issue were the multiple names used to refer to Reyna and her business. There was the Reyna Network, Reyna and Associates, and “Rural Community Enterprise Solutions.” The latter company name was listed as the name RLP borrowers were to make their payment checks to. “There were various organizations that at one time or another were involved in the servicing of this program,” Bradford said. Payments submitted by RLP borrowers suffered a similar lack of recordkeeping. “When you look in the file at the amortization schedules, we could not find any indication of any payment being received prior to August of (2013),” Bradford said. Bradford said he believed the City had received payments from RLP borrowers, but he couldn’t find anhy documentation to track those monies. Documentation was so scarce, City staff had to meet with borrowers in order to learn if their accounts were up to date. “(City staff) had gone back and actually reached out and contacted loan recipients, and the loan recipients provided evidence of having made all the payments,” Bradford said. “The question is where did they go? And I don’t have the answer for you tonight,” he said. Hales-Bradford did discover documentation for a series of wire transfers from Reyna to the EDC that occurred between Aug. 1, 2013 and Aug. 1, 2015. Reyna received $126,000 in payments from borrowers, Bradford said. In turn, she wired $109,000 back to the EDC. Reyna kept the $17,000 difference. “There’s an indication in there when you look closely at the documents provided that an additional 3 percent servicing fee was charged, and then anytime a wire was sent, another $20 was charged,” Bradford said. Furthermore, some of the wire transfers included payments from several borrowers, but Reyna charged separate $20 transfer fees as if each payment had been wired separately, Bradford alleged. “On a wire transfer there may have been five or six payments included from different recipients and a $20 wire fee was charged across the board,” he said. Those fees were in addition to the service agreement Reyna had with the EDC, he said. If City officials obtained assets of the revolving loan program, and if so, did the City establish assets were sold at fair market value and in an arm’s length fashion? Did City officials act diligently to safeguard assets of the revolving loan program? Did City officials have knowledge of misappropriation of assets of the revolving loan program? Did City officials allow assets of the revolving loan program to be misappropriated or otherwise fail to collect payments due to the program? Did officials receive payments, gifts or gratuities from any person connected with the revolving loan program? Though he declined to answer each question specifically, Bradford did wonder aloud why the EDC did not have an independent bank account and why loan payments were not remitted directly into such a bank account. “Ultimately, as the program began to revolve, it would have been much simpler to have administered it at the PIEDC level, and I’m not certain as to why that decision was made,” he said. Bradford also took a moment to allege that gifts and gratuities had been exchanged during this time period. “In our interviews with staff and documented discussions with them in person and over the telephone, strong indication that small gratuities in the form of gift cards, costume jewelry, gifts of that nature, certainly were exchanged amongst City staff members and Petra Reyna,” he said. With that, Bradford ended his report and Mayor Juan Jose “J.J.” Zamora opened the floor to questions and comments. City attorney Gilberto Hinojosa opened by asked Bradford what the interval had been between when Reyna had received payments from borrowers and when she forwarded those payments to the EDC. Bradford replied the lag stretched between 90 days and 6 months. Hinojosa then asked if the payments had been deposited into the City’s general fund. At the time, the City of Port Isabel operated using one single bank account for all its various funds, including hotel/motel tax funds, police asset forfeiture funds and general funds, among others. Bradford offered a summary of his conclusions. “You had a program that did not revolve the way it was intended to revolve, certainly initially. And in my estimated, loaded with significant fees,” he said. Finally, former City Commissioner Mario Tamayo asked how much money the City has spent on the forensic audits, to which Hockema replied approximately $28,000 thus far. Bradford’s forensic audit revealed something else of note — a City employee ultimately purchased the home used as collateral in the RLP’s second loan after the borrower defaulted. Once Mahl defaulted on her $80,000 loan, the City perfected its lien against her house and property. Rene Nava, who was then the City’s finance director, purchased the property for $65,000, according to Bradford’s investigation. Commissioner Carmen Rios, who is a realtor and had been serving on the City’s Beautification Committee at the time, said she sold the property. “I was asked to sell that property, and I did sell it,” Rios said. “But, Mr. Meza, he called me and we listed it,” she said. Rios added that the home was in rough condition and the property had mostly received offers of between $30,000 – $40,000. “But when Mr. Meza called me, he said they were going to accept an offer of $65,000,” Rios said. “To me, that was a good offer,” she said. The sale went through a title company, she added. The city attorney wondered aloud if the sale had followed proper procedure, as City-owned property sales have to follow specific guidelines, he said. He also asked if the foreclosed property had been the property of the EDC or of the City of Port Isabel, which are two related, yet distinct entities. “Does the EDC have to follow the same processes the City has to follow? And that, I’m not sure,” Hinojosa said. Too, she lambasted the forensic auditor for failing to contact her or ask her for any documentation relating to the Yacht Club. Speaking while the Commission had retired to executive session to mull the second preliminary forensic audit report, Reyna said Hales-Bradford hadn’t contacted her for information about the revolving loan program, either. City Manager Jared Hockema said it wasn’t the accounting firm’s responsibility to defend their methodologies. “They (Hales-Bradford) didn’t have to answer their questions about their methodology, why they did or didn’t do it,” Hockema said during an interview after the meeting adjourned. “The fact is that we don’t have the records. Or if we do, they’re not records that could be determined easily,” Hockema said. For her part, Reyna said she does have documentation for the timeframe involved, but admits she had fallen behind in her recordkeeping at the time. “I have all the records,” Reyna said. “Even though what they’re claiming, that missing money and this and that? Oh no. I already contacted the CPA that worked with me,” she said. She credited the temporary lapse in recordkeeping to an illness suffered by her bookkeeper at the time. “I think it was like 2014,” Reyna said. “She was sick and she left,” Reyna said. However, Reyna soon hired on a certified public accountant who began rectifying her books. “But they’ll always pose it differently,” Reyna said. “We’re going to be asking Ms. Reyna for her records,” Hockema said. For Hockema, one of the biggest questions that remains unanswered is why it took so long for Reyna to remit payments from borrowers to the City. At one point, the City had to pursue Reyna for payment, to the tune of $40,000, Hockema said. She ultimately repaid the City in two installments, Hockema said. “The fact that the servicer is not remitting the payments to the City in a timely fashion — that’s a pretty big red flag,” Hockema said. “How is it that you let somebody not pay the City — that’s collecting money on your behalf — for a year and not pay you? I just found that shocking. You can quote me on that,” he said. Both Hockema and Reyna had comments about another one of the questions raised in the forensic audit — whether gifts had been exchanged between Reyna and her firm and City officials or staff. In his report, Bradford said his conversations with City staff indicated that, yes, gifts had been exchanged. Hockema wondered if those gifts had garnered Reyna favor. “Was there a quid pro quo? I don’t know,” he said. Reyna denied the allegation, but not that gift giving took place. But, from her perspective, the gifts were simply small tokens of appreciation. “You appreciate when people help you, you know? Christmas gifts — a little here, a little there. It’s nothing,” Reyna said. “I wasn’t giving it so they could give me a job. I already had a job,” she said. Hockema insisted the forensic audits aren’t meant to specifically look for wrongdoing, but to instead identify deficiencies in the City’s past financial practices. “There’s a difference, right, between are you out there to find wrong, or say, ‘Look, did you do it the right way or not? What happened? Were there any deficiencies?’” he said. He conceded that most of the loans were well documented, but that several aspects of the RLP had the appearance of a potential conflict of interest, such as the fact that a City employee purchased a property which had defaulted as a result of the revolving loan program. Another potentially sticky point was how Reyna fulfilled multiple roles in managing the program — as administrator, underwriter and servicer. Hockema also claims it was the USDA that first suggested the City perform the forensic audits. “The USDA had questions about all three (projects),” Hockema said. “There had been concerns that had been raised by them (USDA) and they were not raised by us, so someone else must have contacted them about her,” Hockema said. Reyna flatly denied that. “I had never gotten anything written up on the programs,” she said. Previously, Reyna has managed revolving loan programs for the cities of San Benito, Raymondville, La Feria, South Padre Island and Falfurrias, according to records found online. The Port Isabel City Commission spent an hour discussing the audit in executive session Tuesday night. While still in open session, Commissioner Martin C. Cantu offered one final comment. “For the record, mayor, I’d like to see some kind of action taken by our city attorney and the commission on the findings of this towards these people,” Cantu said. “We’re going to be going back to executive session, commissioner. We can’t be talking about it,” Mayor Zamora said, interrupting Cantu. After the meeting, however, the mayor indicated the City would be filing a lawsuit, but declined to offer specifics. “We’re going to have lawsuits pending on this, as much as I can say,” Zamora said. “If he said that, he said that,” Hockema said afterward. Like the mayor, the city manager declined to provide more details. “We look at what issues come up and what remedies are available to us and we pursue them,” Hockema said.